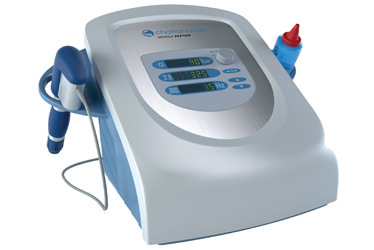 Radial Shock Wave Therapy is proven to be 80% effective in the treatment of heel pain through clinical trials. Radial Shockwave Therapy (RPW) involves pulses of shock wave energy generated by compressed air. These focused shockwaves offer excellent non-invasive treatment to soft tissue pathologies with very few negative side effects. Painful tendonopathy; soft tissue/connective tissue trigger points; muscle sprain/fatigue and to dissolve calcification. It can be described as a "flicking" sensation. This is usually tolerable; however pain levels can increase closer to bone. We can alter the intensity of the shock waves to improve your comfort level. If you experience any side effects they usally appear within 2 days post treatment and usually disappear after 3-5 days. These side effects may involve, pain, reddening of the area or red spots, swelling or bruising. Ice to the area usually improves these symptoms. Stretches will be given to you following the treatment, these are an important part of your treatment protocol.